Halloween is right around the corner and we have many ideas to help you celebrate… without all the toxic and disposable products and loads of candy! 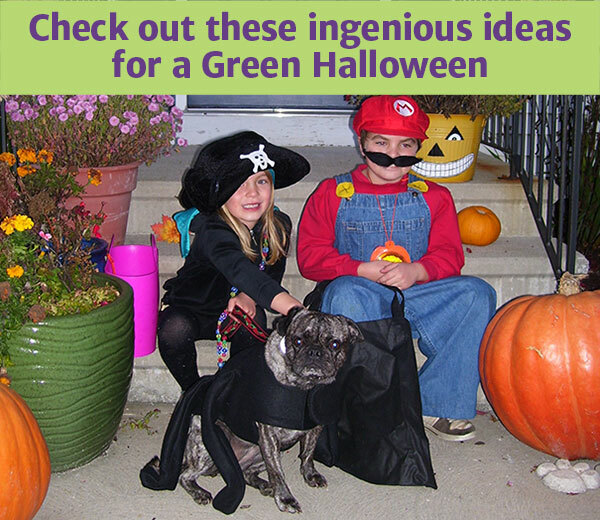 From eco-friendly costume ideas to healthy Halloween treats, these ideas prove you can indeed go green without putting a damper on your Halloween celebrations. Instead of buying plastic masks made in China (which are usually made of toxic PVC and smell horrible because they are offgassing) try making masks out of paper plates, plaster of Paris, or other craft materials. Use old boxes, scrap fabric, and other recycled materials to create amazing costumes. Try to think “reusable” for any costume parts and props you must buy. For example, get a nice sweatsuit that doubles both as part of the Halloween costume and, later, play clothes. Shop the thrift store for odds and ends to create a costume. Host a costume swap. Reserve a room at a local gathering hall, church, or library and Invite friends and acquaintances to bring good-condition costumes from past years and outgrown dress-up clothes to exchange. Use social media to get the word out quickly — a larger crowd means more options for everyone! Set up tables labeled by size and have participants place their unwanted costumes onto the appropriate tables. After everyone has sorted their old costumes, allow them to “shop” the tables for a new costume (bring 1 costume, take 1 costume; bring 3, take 3). Donate any leftover costumes to a local charity. You can also host a costume swap the week after Halloween so you’ll be ready for next year! If you do choose to hand out novelty toys, instead of buying them, collect what your kids get from birthday parties and events throughout the year and save them to give out next Halloween. Rather than driving from house to house and wasting gas, walk! If you’re out in the country, consider a short drive to a more populated, walkable neighborhood. Collect treats in a sturdy reusable shopping bag or even an old pillowcase, instead of plastic bags or buckets that will wind up in the landfill and never decompose. Wondering what to do with all the excess candy your kids are bound to get? Check out last year’s Halloween post for ideas! Invite your guests to come in only homemade costumes. Host a contest for the best creations. Buy quality decorations that will last for years, or make your own with recycled materials. Skip the disposable paper goods. Ask a friend to bring extra cups or cloth napkins if needed. If you must use disposable paper products, opt for sturdy ones that can be washed and reused several times. Be sure to compost your jack o’lanterns after Halloween, rather than throwing them in the trash. Check out these recipes for healthy Halloween party treats.